Virtually everyone knows that being overweight can be seriously detrimental to your health and wellbeing. However, many of us fail to realise that excess weight can be just as dangerous for our pets, and a kitty who is carrying a few more pounds than she should be is just as much at risk of developing health problems as the heavier members of your human family. In fact, it may surprise you to know that hospital researchers have found that as many as 1 in 3 felines are overweight – and unfortunately, that number is predicted to rise. Obesity is actually the greatest health threat to cats, and there are many different ways in which your pet carrying extra pounds may put their wellbeing at risk and cause problems for you as their owner. Cats that are overweight are significantly more likely to need regular visits to their veterinarian because of the health problems that they experience. This can be both costly and time-consuming for busy owners, as well as being stressful for your pet. Your kitty may also need medications and treatment, which could be tricky to administer. Some owners even find that their insurance costs rise, or they struggle to obtain cover, because their feline is considerably overweight. If you have identified that your furbaby is tipping the scales a little too much in the wrong direction, then your next priority should be taking steps to reduce her weight, thus reducing her risk of developing mild to severe health concerns. Like their human owners, cats that are overweight almost certainly need adjustments to their diet. However, this is something that you will have to do on your pet’s behalf. The single most important thing that you can do to help your cat to lose weight is to control the number of calories and the amount of fat in your kitty’s diet. Cats are carnivores, and as such, their diet should be primarily meat-based. Increasing the proportion of canned and raw foods into her diet is useful when trying to help your cat lose weight, as these foods are high in meat protein, low in carbohydrates and has a lower calorie density than dry alternatives. If you must feed a dry food, try and choose one that is specially-formulated for weight loss. These will ensure that your furry friend still receives the nutrients that she needs while losing weight. Physical exertion is still a bit part of staying healthy, and encouraging your kitty to move more will speed up her weight loss as well as building strength in her muscles, heart and lungs. If your cat isn’t keen on being taken out for walks, try and incorporate more games into her daily routine, such as getting her to chase a fluffy toy or a red laser pointer. However, remember that your feline only has a short attention span, so keep playtime short and sweet. As well as changing what your pet eats, you may also want to address when and how she eats. Many owners now ‘free feed’. The problem with this is that there is zero portion control, and so you don’t really know exactly how much your cat is eating and it is easy to overfeed. Each cat has a recommended amount that they should eat each day. 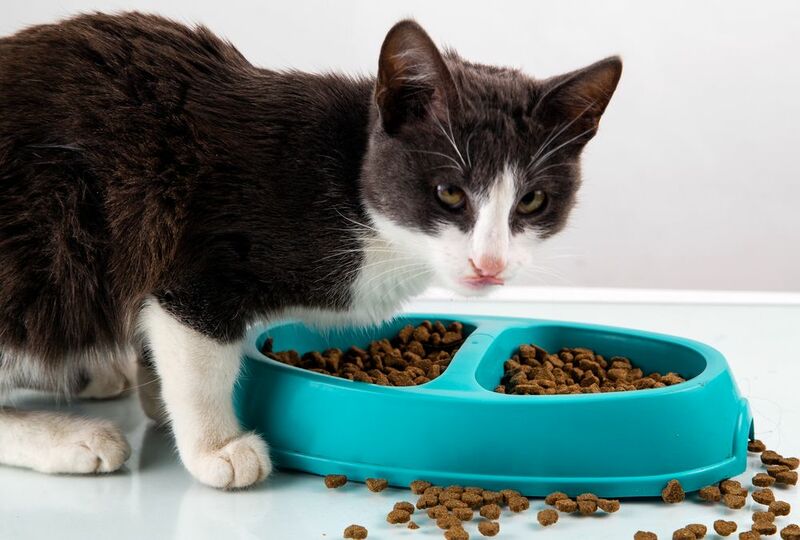 Whether you spread this over three meals or as many as six is up to you, but some owners with cats that prefer to graze all day find that offering smaller meals more regularly is better for controlling their kitty’s weight. If you are concerned about your cat’s weight, you should contact and make an appointment with our vet to obtain further advice about the right nutrition and exercise to help your kitty be as healthy as she possibly can be.